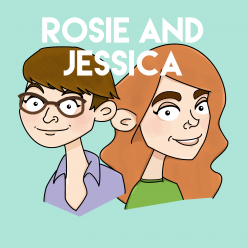 In episode 90, Rosie and Jessica pass the tissue box as they share their Top 5 Tearjerkers, but not before Jessica stuns and wows us with tales of packed lunches and mouse deaths. There are very different fancy dress costumes and the prospect of Australian-Canadian seasonal swapping. This episode is sponsored by Rodent Conspiracy’s new album A Fun Risk of Explosion. Jessica picked Give Me One Reason by Tracy Chapman, while Rosie went for Whitechapel by S.C.U.M. Rosie has finished knitting the Age of Brass and Steam Kerchief and is back working on her Belmont cardigan. Jessica is contemplating what to do with her Able Cable hat. A new addition to the Operation Get Festive repertoire – She & Him have a new Christmas album!